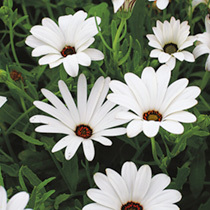 Toby says: "A native South African plant bearing glistening white, daisy-like flowers. The robust, drought-tolerant plants are ideal for borders, rockeries and dry stone walls." Flowers June-September. Height 30cm (12"). HA - Hardy annual. Sow March-May outdoors, flowers June-September. Ideal for beds and borders, patio pots and containers, rockeries. Prefers full sun . Beautiful daisy flowers that spread sheets of colour on rockeries, borders and dry walls.